Investors know that the traditional fees charged by a hedge fund or commodity trading advisor are 2/20 – a two percent annual management fee for assets under management, and a twenty percent incentive fees on net new profits generated by the fund. While the standard has long been the 2/20 structure, investors can many times negotiate slightly different fee structures depending on the size of their investment. If your performance expectation from an investment is to gross less than 15% annually, then you’re better off taking the 0/30 fee structure. 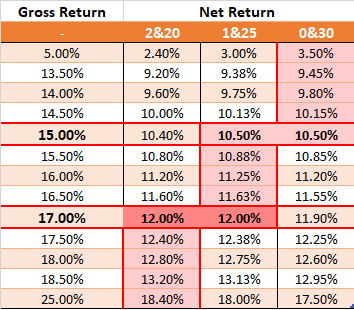 Gross returns up to 15% yield the best net return (10.15%) with a 0/30 fee structure. If expectations are that gross returns will be between 15% to 17% annually, then taking a 1/25 structure yields the highest net return. If expectations are that a fund’s performance will exceed 17%, then the 2/20 fee structure is preferred. Any return greater than 17%, and 2/20 will yield you the highest net return. The higher the return past 17%, the greater the difference becomes between 2/20 and the other two fee structures. Forecasting a fund’s performance could seem like a daunting task – how do you “predict” what an investment will yield? The best way to make a projection is to look at the average annual historical return, and compare that with the annual standard deviation. This should provide an expected range of returns for the investment, and help determine where it falls on the table. For a conservative return expectation (single digit returns), the 0/30 fee structure should be a no brainer; 0/30 yields the highest net return, and if the fund underperforms – either low single digit returns or negative returns – then the savings with 0/30 can be substantial when compared with the 1/25 or 2/20. Conversely, for aggressive investments, the 2/20 fee structure offers the most savings as gross returns exceed 30%.